Over the last decade, maritime security concerns have featured prominently in ASEAN member states’ individual and collective agendas. Issues as diverse as China’s aggressive maritime strategy, piracy, terrorism, transnational organised crime, and illegal, unreported and unregulated fishing in the Asia–Pacific are consistently challenging sovereignty, the rule of law and regional stability. Malcolm Davis’s recent Strategist series  on ‘forward defence in depth ’ for Australia has highlighted the importance of engagement in the region in response to the Chinese government’s challenge to US primacy in the Asia–Pacific. That thinking also needs to be applied to the broader set of maritime security threats facing Australia and the region. During the past five years, ASEAN nations have increased their coastguard and maritime border capabilities  in response to the progressively more complex maritime security environment. However, there are serious ongoing concerns about most ASEAN states’ capacities to deploy and maintain these capabilities, and to use intelligence and surveillance effectively in coordinating their operations. In line with Davis’s analysis, there are opportunities for Australia to do more in partnership with ASEAN coastguards that will give us further forward defence in depth. Efforts are already underway to improve coastguard cooperation. For example, Australia is actively involved in naval cooperation programs across the region. 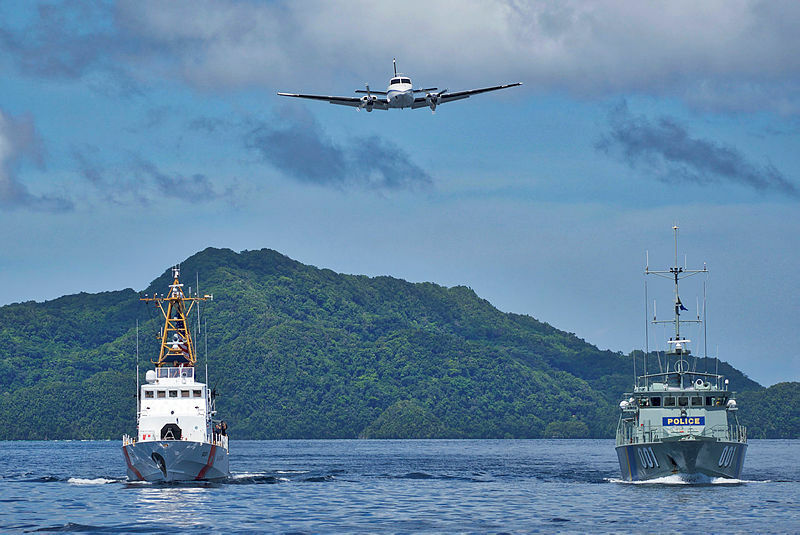 Australia’s membership of the Heads of Asian Coast Guards Meeting  continues to offer significant promise for coordination on maritime domain awareness. The forum was set up in 2004  to focus on cooperation in combating piracy, but the scope of discussions has since expanded to include law enforcement, maritime security, disaster prevention and relief, and capacity-building. The US and Japan have also been particularly active in the Asia–Pacific in the areas of maritime security and, more recently, coastguard capacity development. The success of bilateral and multilateral maritime security cooperation in regional hotspots like the Sulu Sea in the Philippines and the Singapore Strait also offer a vision of what might be possible. While these are all positive developments, further enhancements to maritime domain awareness and coastguard cooperation will require far more than joint patrols, meetings and ad hoc bilateral or multilateral exercises. Successful security cooperation in ASEAN is predicated on building trusting relationships between people and agencies. Developing those kinds of relationships takes time and entails creating opportunities for officials at all levels to interact. The Australian Defence Force understands the importance of trust and has established an extensive framework of joint training programs. The Australian Defence Force Academy and the Royal Military College offer great opportunities to build long-term interpersonal and organisational relationships of trust. The Australian Federal Police has had similar experiences to those of the ADF and has reaped similar rewards. For almost 15 years, the Jakarta Centre for Law Enforcement Cooperation  has served as a regional rallying point for much-needed counterterrorism capacity development and cooperation. The AFP’s investment in joint training at the centre’s facility in Central Java has created opportunities for building capacity and trust. While the Royal Australian Navy already conducts joint training with the ASEAN nations’ navies, the increased use of civilian coastguard agencies by ASEAN states arguably creates a new group of participants with their own capacity-development needs. An initiative to deliver coastguard capacity-development programs and, just as importantly, create opportunities for encouraging new relationships, would therefore be timely. A regional coastguard academy might serve to achieve both of those outcomes. The academy’s curriculum could focus on building regional capacity in areas such as executive leadership, strategic command, maritime counterterrorism planning, maritime domain awareness, capability development and strategic maritime policy. Given Australia’s strong maritime security reputation, there’s a good case for the academy to be based in northern Australia. Establishing the academy on the frontline of Australia’s maritime security, in a location such as Darwin, would have great symbolic value in demonstrating the significance of the maritime security challenges we share with our neighbours. While the departments of Defence and Home Affairs would both have roles to play in the academy, the Australian Border Force has stronger civil–maritime security links and so would be an ideal lead agency for this initiative. The coastguard academy’s core operating budget would need to be provided by the Australian government. An initial capital investment in a small physical campus in Darwin that includes accommodation and instructional facilities would be needed. The ongoing operating budget for this kind of institution is likely to be around $7 million a year. Flexible course structures and teaching systems would allow other donors (like the US, Japan and India) to fund and teach numerous specialised courses at the academy. To further reduce the cost burden on the Australian government, the academy could be managed by a modest number of permanent staff, with course delivery coordinated through a surge capacity that leverages experts from organisations like ASPI. A regional coastguard academy would attract Chinese government attention as it would run counter to the Chinese state’s preferred bilateral engagement model, and because it may be effective in creating regional cohesion in dealing with maritime security issues. The initiative might also send a clear message to Beijing that the countries of the region are taking measures to protect the sovereignty of their waters. John Coyne is head of the border security program at ASPI. Edited image courtesy of the Department of Defence.